In the following year the band was assisted by a drum and fife band under the leadership of Mr Robert Tongue. The speaker was Mr Fred Adamson from Epperstone. These first meetings were held in the middle of the week. After the gathering a tea for workers took place and the money received was assessed at the rate of 2s.6d. per 25 scholars. The procession order was established from the very first demonstration the first school taking the last position the following year. After tea in the various schools and churches, a stall was erected for the sale of sweets and minerals, and sports followed organised by Mr William Stafford. (Ex. P.) Mr John Orange, Mr John Smith, Mr G.B. Smith. (Ex. U.M.) Mr William Blood, Mr Sam Blood, Mr William Collyer, Mr George Turton. (Baptist) Mr John Binch, Mr Harry Lee, Mr John Spencer. Mr William Fisher was the first secretary, followed by Mr H. Lee, Mr B. H. Meads, Mr Nelson Binch, Mr B.S. Hunt, and Mr Stanley Blood. The first treasurer was Mr William Collyer, followed by Mr C.E. Collyer and Mr G.W. Collyer. All these men rendered solid service. 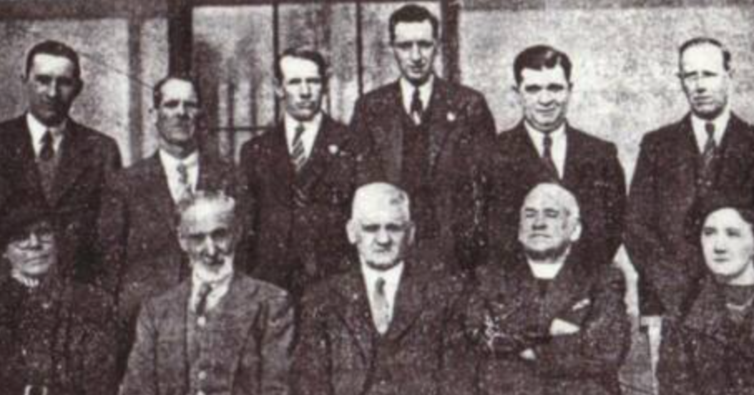 Above left, 1941: Three members of the 1891 committee. 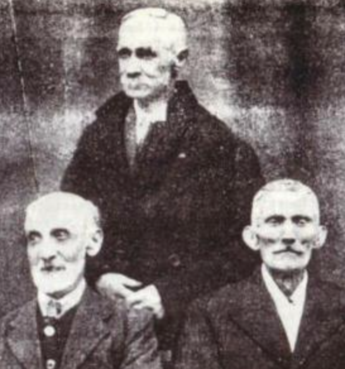 They are Mr John Orange, Mr Fred Martin and Mr Sam Blood. Above right, The 1941 committee: They are E. Binch, N. Binch, P. Herring, W. Porter, W. Hind, W.S Belt, Mrs S. Binch, J. Orange, C.E. Collyer, Rev. J.H. Taylor, Mrs Burrows. The Jubilee comrnemorative meeting took place on a Thursday evening with speclal singing by Sunday School Scholars from the five Sunday Schools ('Sunday Schools Are England's Glory' and 'Stand Up! Stand Up For Jesus!' featured), The speakers were The Right Rev. Bishop Talbot, Rev. Taytor, Rev. G.R. Trussell and the Rev. J.W. Almond. In the souvenir programrne the Rev. Taylor exclaimed, "l am but a recruit amongst the veterans who have seen this great work commenced and continued. What this Annual Demonstration has meant to the spiritual life of Calverton cannot be estimated . . . "
'The Feast . . . it were in Martin's where the doctor's is. Ashley's come there every year, Staples come wi' them like, running stalls. They were a good do, they done well. They stopped one weekend extra in nineteen, about Twenty Five. It were very strong then. There were all sorts, there were Ashley's horses always, the main attraction. They'd come about Thursday and go back Monday. Friday night and Saturday night... sometimes, they'd have Monday. We'd get off early from school for Friday night. They used to do Oxton and Woodborough in July. They retired to Cropwell Bishop. There's only about one daughter left. But its gone, like, along with the times. 'The Sunday School demonsrations . . . There were United Methodists, Primitive Methodists, Wesleyans and Baptist church didn't have much to do with it. - They went round the village . . . till the new estate, and chapels kept falling away. They finished in about '50, they didn't do much good after the war were over. Nobody took an interest in them, when folks started going holidaying and that. They fell away that bad there weren't half a dozen one time.' [John at 82 can remember the best of the demonstrations held at a time convenient to village life, preceeding, as aforementioned, the busy time of harvest when, "they were all in it, Iike . They were at Calverton!" . 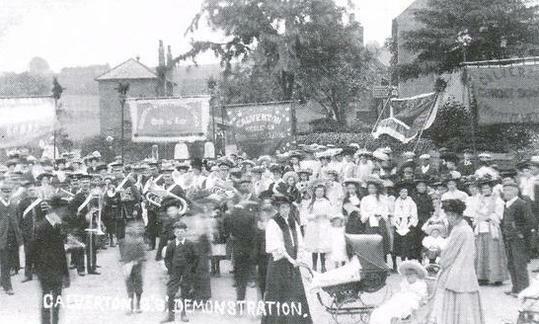 . .] 'One Demonstration about 1930, there were buses running till midnight, to Arnold and Nottingham, taking folks. It were alright while it were on, a good tea, sports and races, and band, playing. Running for prizes. There were a pig in a raffle! Motor cars done it . And when folks started holidaying, they wanted money for holidays. That done it!" John Binch in conversation July 1990.